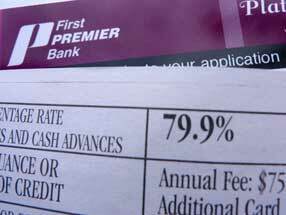 First Premier Bank offers credit cards to those with very bad credit. Many people who cannot get a credit card anywhere else will qualify for a First Premier credit card. Sometimes, I have wondered if they ever deny anybody. A guaranteed approval may sound great, but there is so much more a person should learn about a First Premier credit card before they actually apply for one. 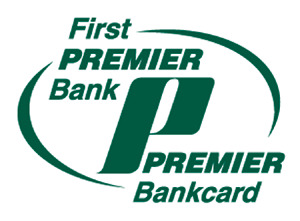 First Premier currently offers the Aventium and Centennial credit cards. There is very little, if any, difference between them. Years ago, the First Premier credit cards simply said First Premier on them but now have one of the two names we just noted. It is possible for a person to have one of each. Both will have very unreasonable fees that come along with them and will have lots of surprise fees that is unheard of in the credit card industry. Back when I had a First Premier card, I had an interest fee that was 29.9%. I have heard that some people had interest fees of up to 49.9%. Either way, you know that these are ridiculous fees for anyone to pay even if they do have bad credit. Many years ago, the company was charging some of their customers up to 79.9% interest but stopped due to complaints that caused pressure. The card will have an annual fee tagged to it. Many credit cards, even the good ones will sometimes have an annual fee so we cannot get on First Premier too much for this one. I believe the annual fee for my card was $79. You must remember that this was about ten years ago. I m sure that their annual fee is higher now. There is also an initial acceptance fee of $119. I thought that a credit card company was glad to have your business. To charge a person to accept your credit card is simply ludicrous. OK, I remember, First Premier is doing those with bad credit a favor so they can do this - Unbelievable! The good old folks over at First Premier also charge a new customer a $35 processing fee. Apparently, they must work harder than other credit card companies to process your application because no other credit card company charges for this. As you can see, this company will nickel and dime a person as much as they can. We are not done yet. They also charge what they call a monthly participation fee. This $6 monthly participation fee will be billed every single month to the card holder. A small $6 charge may not sound like a lot, but that is $72 a year for participating in I don't know what. What are First Premier card holders participating in? Certainly, whatever it is must be valuable, but can someone please explain this to me? When a person receives their First Premier credit card, they will have a very small available credit balance to use because of all the fees that will appear on their first statement. They may have only $50 to $80 to spend and immediately have a balance of $200 to $250. 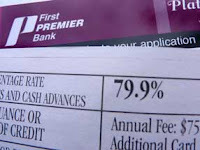 Amounts may vary because First Premier is sometimes changing their fees due to the pressure that they are constantly facing due to their rip-off tactics. When they face pressure to lower a certain fee, they will make it up with another new fee. How does First Premier Bank attract customers? This is very easy - they simply target those with very bad credit who cannot get credit anywhere else. They know these people are desperate for credit and will use the "We will help you rebuild your credit" statement. A person will usually receive their credit card offer in their mailbox and be glad that someone is offering them credit. The offer will sound great to a person with bad credit. Anyone offering a fresh new start will always gain the interest of consumers. The sad part of it is that they will take advantage of a consumer all they can in order to help them. It is true that a person with bad credit will not ever enjoy the benefits that a person with good credit enjoys. This is very understandable, but there is a certain point where the line must be drawn. First off, most people who get a First Premier credit card will be given a $300 credit limit. That is what I received about ten years ago when I received my card. I have heard from others that they received $250 credit limits. I don't know how they judge this but it is safe to assume that a new customer will be given a small credit limit as mentioned. That is understandable, come on, what do you expect with your bad credit. When the application is signed, sent in and the credit card is received, a person will not actually have $300 to spend. Why? Well, on that application, many fees were noted that the applicant agreed to when they accepted the offer. When they receive their credit card they will actually only have around $50 to spend. There was a time that I had thirteen credit cards that I had to make a monthly payment on. I know, that it way too many credit cards for a person to have, but that is another story for another time. You'll be glad to know that I currently have one. At that time, I would make all of my credit card payments online except for one of them. 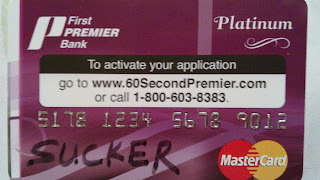 You guesses it - My First Premier credit card. Why? Because they wanted to charge me a fee of $4.95 to have Internet access to there site. I had never heard of anything like this before! Why in the heck would someone charge me to pay them online? All of my other credit card companies welcomed me going on their website and making my payment. I could have paid the small fee of $4.95, but I just did not see any sense in it. Why are these guys the only ones charging for something like this? They also charged for making a same day payment over the telephone. If your payment is due on the 5th of the month, this normally would mean that you have until the 5th of the month to pay it. With First Premier, they see things completely different. If you make your payment on your due date, you will be alright as far as late fees go. The problem is that they charge what they call "Expedited Service." Anytime you make your payment over the telephone on the due date, you will be charge this expedited service fee. It has been a while and I don't remember what the fee is, but I think it was something like $12. The First Premier credit card is the worst credit card that anybody can ever get. I advise anyone who is thinking about using their services to quickly reconsider. Just because you have bad credit does not mean that you should be taken advantage of. If you stay away from First Premier credit card, you will be doing yourself a big favor. There are several high risk payment service provider that concentrate on this kind of account. we've a bent to build it simple for them. we've a bent to perceive high risk merchant accounts.